Today I have a Random Monthly Pictures post for you. Again, I have to start taking more pictures! 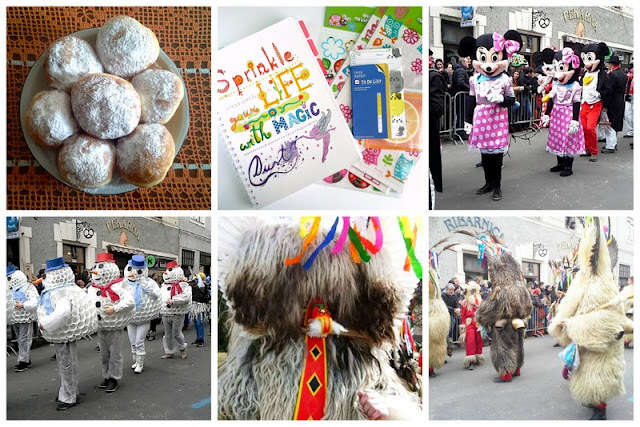 In February we have Pust (Carnival) and for me this is one of the most interesting events in the whole year. Basically, it's like Halloween, but more interesting. We dress up and go to different parades and parties. I would have more pictures, but I mostly took videos and I forgot about pictures :/ Most of the pictures are from the parade, but first one are homemade krofi (some kind of doughnuts). We eat them mostly around Carnival time and on the second one you can see my planner. On the third are Mickey Mouses and Minnies in a parade, fourth are some children that made their snowman costumes themselves out of cups and other stuff. On the fifth picture is my boyfriend in a traditional costume - Kurent. And on the last picture you can see more of Kurents. By jumping they chase evil spirits and winter away and call the spring and a good harvest.